Do you spend hundreds and hundreds on scented candles each year? 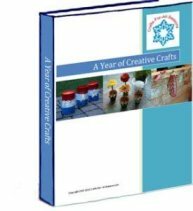 Have you ever considered making your own? Come... let's see how to get started with making your own candles at home. Don't get intimidated thinking candle making would be a messy or a very scientific chemical process which would need to put your thinking cap on. Trust me, when I wanted to try my hand at candle making, even I was very skeptical about the process. But, it's just easy to get started with making your own candles. You just need a few simple ingredients. These handmade candles would also make a thoughtful gift or a party favor during any season. The most wonderful part about making homemade candles, is that you can use any variety of inexpensive mason jars, small glasses, food jars, tea cups, coffee cups, or any little metal containers. You can get creative and customize these candles using various fragrant oils of your liking. Here I've also used glitter to just give that sparkling environment. Dealing with wax sometimes becomes a rather messy thing. Especially as it melts, droplets can get anywhere and everywhere, and you won’t even know it until the wax dries. To avoid this, use newspaper or paper towels around your work area. And if by chance some of those droplets do get on your work space... don't worry, cleaning wax isn’t that hard. Wipe it off immediately or if you haven't noticed that the wax has fallen, even that would be easy to clean. Just scrape it off with a knife or use your fingernail. Keep your materials ready at hand. Once you start melting the wax, there would be hardly any time left before it starts hardening. wax by using double boiler method. Take two containers, one for pouring water and the other for melting the wax. Pour water in the bottom pan, and put the wax pieces in another container and put it on bottom pan. Start heating. Keep your burner on the lowest temperature so that it doesn't burn up your wax. I love watching the wax melt! 2. While the wax is melting, stick the wicks in the containers you want the candles to be made in. Use glue to stick the wicks to the container or just dip the metal tab of the wick into the melted wax, then quickly place it to the bottom of the container. Hold it for just a couple minutes and when the wax hardens it will be stuck to the bottom of the container. 3. Once the wax is totally melted, add the glitter powder and carefully pour it into your containers which you are using to set the candle. If you are also using scented oil, then add it at this stage. Here, I've used small mason jars and small sized paper cups to make the floating tea light candles. As soon as you pour the hot wax, you will see the the wick starts swaying. Use tooth picks to secure the wicks in place. 5. Once the wax has cooled down, sometimes you may see the the center has sunken. That happens! Don't get disheartened... just pour in some more hot wax to make the surface even. Don't add too much wax, or else you would end up with one more sinkhole. Let it cool off completely and trim the wick if needed. That's all... your candles are ready to be lighted. I poured some water in my Brass Decorative Uruli, put in some flower petals and lighted the floating candles in the center. Thank you so much for posting this. You give great tips on how to work with wax, which is great for a beginner. Thank you for sharing your beautiful work! 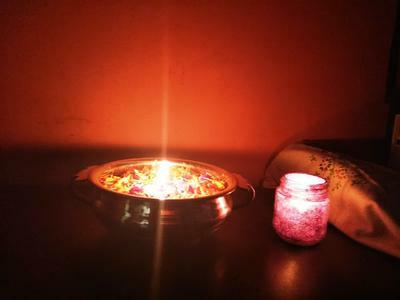 thank u so much..... you can visit http://rajiscrafthobby.blogspot.in/2016/12/glitter-jar-and-wax-tealight-candle.html for step by step pictorial details.